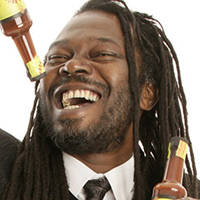 Ahead of the MADE Festival in Sheffield where he’s a keynote speaker, we asked Levi Roots about his role as a business speaker, his love of music and what he’d be doing if he hadn’t appeared on THAT Dragons’ Den show. Hi Levi, congratulations on all the success you’ve had with your delicious sauces, a cookbook and TV show since appearing on Dragons’ Den! You’ve since become one of the UK’s most popular and high profile business speakers. Is this something you are deliberately focusing more of your time on and why do you feel this is important? I’m really enjoying it, although I’m not the archetypal speaker and I’m probably a bit different from what people are used to. I spend a lot of time going into schools, which I love. Who else, at 55 years old, gets to go into primary schools, have kids singing their songs and telling you how much they love you? It’s what life is made for and to me it’s just about enjoying myself. But I also know that it’s a serious thing I’m messing with. When I’m telling people about their precious ideas that they have asked me about, I always speak truthfully about what I would have done in their situation. Sharing advice is a big responsibility. What do you think you would be doing if you hadn’t appeared on Dragons’ Den all those years ago? Would you still be selling bottles of Reggae Reggae Sauce or would you have given up and launched a different business by now? That’s an easy one. I think the sauce would still have made it. It might not have been as big and I know it wouldn’t have taken off as quickly. But because of the reaction of people, I know we have something that’s really good. If you bide your time something always comes along, but Dragons’ Den gave me an opportunity to have almost overnight success. Your story is a great example of someone who raised investment not just because you had a great product, but because you were able to charm the Dragons with your personality and singing. I remember you appeared to be quite humble and not as brash as many other entrepreneurs can be. Do you think this is something more people in business could learn from? Well I’m still just silly old Levi. I don’t say anything or do anything differently. I still live where I’ve always lived and talk to the same people. I haven’t changed as a person and I still have all the things that inspired me around me, the same friends, I still have my music and I still do things that make me happy. One thing that has changed is that people now ask me for business advice. I think more people should stand up and be mentors so that young people can say “he’s done it and I want to hear from him, I don’t want to hear from someone who I don’t understand or who is not from my neck of the woods”. Although I knew you could sing, I only just found out that you not only performed with James Brown and Maxi Priest but were also nominated for a ‘Best Reggae Act MOBO Award’ in 1998. Can you tell us a little more about your music career and how important is music to you these days? Are there any new artists or musicians that you can recommend? Actually I’ve got a new album coming out soon and two singles. I’ve been singing that damn Reggae Reggae song for the past seven years now and it’s time to record a proper album. I always try to make time for music because it’s a big part of me and what the brand is and I’m still really passionate about it. If you were starting out in business again, where would you go first for business advice / funding or what would you do differently? I wouldn’t have done anything differently. When you’ve reached the end of your journey and you look back every step of the way that you’ve come, it’s important not just to look at the good things but also the trials and tribulations that made up the journey, otherwise it would be bloody boring story. The whole story, everything from my life, has made me who I am I wouldn’t want to go back to [the difficult times] but for some reason that is the way things happened and that’s how Karma made my journey. If you want to hear more words of advice from Levi (and perhaps some of his new music too), book your ticket for the MADE Festival in Sheffield at www.madefestival.com where we’ll also be on hand to tell you how you can start and grow your business with Sage One. We’ve also got an excellent free fringe event at Electric Works on Friday 26th September featuring Brad Burton, Tina Boden and Tony Robinson OBE which you can book at http://startyourbusinesswithsageone.com/eventbrite.com or by clicking on the form below.